For many, the inner workings of a septic system are a mystery. Most people don’t need to have an understanding of how their septic system works, as long as it’s working. However, in those times where things start getting wonky and you start seeing the symptoms of septic system failure, it’s important to understand what’s going on in your system. While nobody needs to have a comprehensive knowledge (that is, after all, why you call professionals), it helps to know the basic functionality of your system — what it does, and how it works. There are many different types of septic systems today, some of them using sophisticated and innovative technology to get the job done. LPP septic systems, mound septic systems, and peat septic systems are all examples of this. However, the most ubiquitous and well-known system is the gravity septic system. Let’s take a look at how it works. Every septic system has a common purpose — receiving the wastewater from your home, separating the solids from the liquids, and then disposing of those liquids. To do this in a gravity septic system, we rely on one of the most old-fashioned tools of all time — gravity. 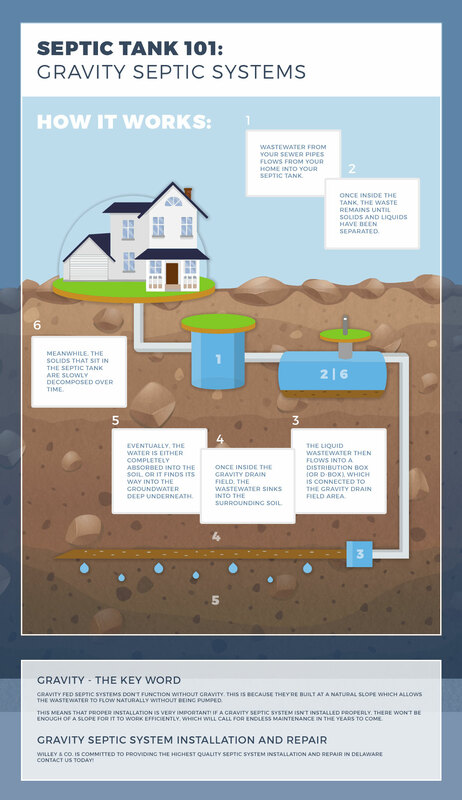 First, the wastewater from your sewer pipes flows from your home into your septic tank. Once inside the tank, the waste remains for quite some time until solids and liquids have been separated. The liquid wastewater then flows into a distribution box (or d-box), which is connected to the gravity drainfield area. Once inside the gravity drainfield, the wastewater sinks into the surrounding soil. Eventually, the water is either completely absorbed into the soil, or it finds its way into the groundwater deep underneath. Meanwhile, the solids that sit in the septic tank are slowly decomposed over time. Affordable: Gravity fed systems don’t use any sort of amazing or groundbreaking technology — they simply use natural forces to guide the wastewater where it needs to go, making them a common and affordable option. Easy to Service: Due to the same reasons listed above, gravity fed septic systems are relatively easy to service. Rather than complicated technology going defunct on you, the most common problems are usually results of the earth shifting (thus negating the gravity effect) or leaks in the system. Not Ideal For Every Home: The gravity system depends on a slope to achieve its results. The simple fact is that there are many homes which don’t have the right setup for a gravity fed system to work. Sometimes the terrain just doesn’t provide a viable spot for a gravity system, forcing you to choose another option. Unfortunately, sometimes they are installed in less-than-ideal conditions, causing a lot of repair problems down the line. If you have a gravity-fed septic system in your home, there’s one thing you need to know for sure — Willey & Co. can help you out if you need assistance with installation and repair. We mentioned earlier how gravity septic systems rely on a good slope in the initial installation. 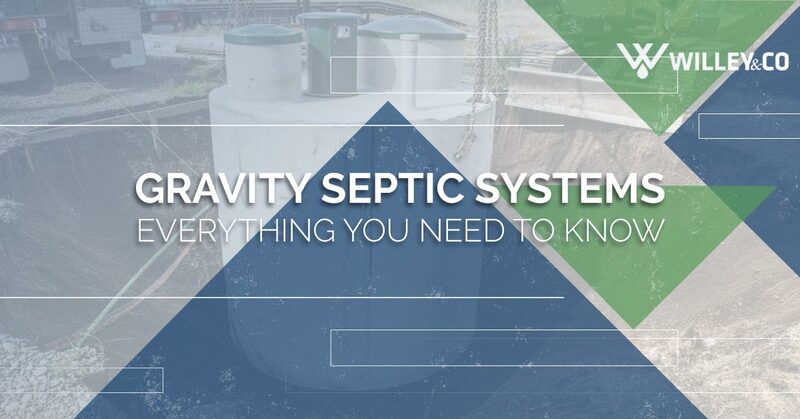 Did you know that there are many septic companies out there who will install a gravity system in unfavorable conditions? This can result in a gravity drain field that doesn’t get a lot of actual gravity. Some companies don’t care because it makes them a quick buck. At Willey & Co., this is unacceptable — customer satisfaction is our number one priority, and we do everything in our power to ensure that our service results in a septic system that is healthy, functional, and reliable. Septic tanks, more so than most other home systems, depend on a quality installation for longevity. If the initial installation process is botched, it can spell trouble for years to come. There are few things in your home that are more frustrating than a failing septic system. Water starts backing up, nasty odors make their way into your home, and drains stop working. It’s an icky experience, and that’s why we want to help. If you’re experiencing issues or problems with your septic system in Delaware, we can provide the solution. We’ve served all kinds of clients in Delaware, from Sussex County to Kent County. Whether you’re in Dover, Magnolia, Georgetown, Laurel, Seaford, or any other of the surrounding areas, we’re just a call away. Contact us today!